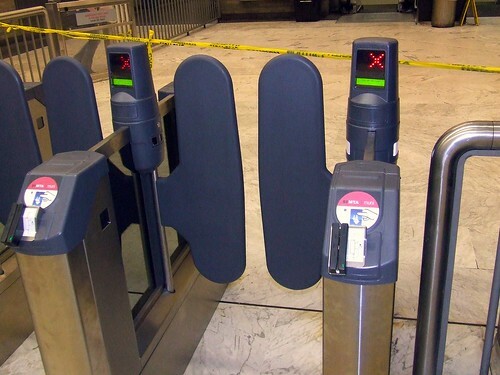 During the next few weeks, Muni is installing the new fare gates and activating the ticketing machines. To give you a refresher, I mentioned in previous posts about what the new gates are like, and how the new limited use ticket works. Just last week, the new gates and ticketing machines was activated at Civic Center station. The east entrance (primary agent booth) has half of their gates are new while the other half are turnstiles. However, the ticketing machines are not yet ready. The west entrance (secondary agent booth) has all brand new gates and ticketing machines active for usage. When exiting the station, the swing gates are slow to identify you so it can open. You have to break your walking stride by stopping until the gates open. When entering the system, once you approach the gate you want to enter, the optical sensor notices your presence and asks you to tap your Clipper card. The ticketing machines work well, but when tagging your card to add value, you have to hold it on the sensor tag for a long period of time. Oddly, other transit agencies don't have that lag time with the exact machine from the same manufacturer. Strangely, the machines forces you to pick how much e-cash value you want to add (minimum $2). Old Clipper add value machines is just insert as many dollar bills as you want and that's your value. The new machines do have an edge, it can issue change while the Clipper machines won't. Users of paper passes can enter using the card swipe device. With your right hand, face the pass stripe down and to your left, and swipe the pass in a downward motion. While Muni transitions their old turnstiles for the new gates, if you use a Limited Use [paper] Ticket, at anytime you enter the station with turnstiles, the card must be tagged to the stationary reader next to the agent's booth. The turnstiles with Clipper readers won't accept them. For the love of god, please don't use the new emergency swing gates. The alarm sound is really really annoying. Basically, Muni expects to complete the transition by early October. In November, the transition of paper "A" passes and disabled stickers will be Clipper only. Hopefully, Muni and Cubic (manufacturers of the gates and ticketing machines) can shake out the bugs for quicker responsiveness of the system. I saw these in action a few weeks ago. Agents were telling people to walk through and the patrons were running into the gates because they hadn't opened yet. *facepalm* This will get better, right? Jason: Hopefully! It's a new learning curve for everyone. The machines are slow to recognize you as in it is necessary to tag out? Tagging-out is not required for Muni. The gates have optical sensors that when tripped, is supposed to open the gates when exiting. Oy.. I was JUST about to tweet you to ask if by any chance you know if the Clipper Add Value Machines are working yet (i'm a bad person and have no purchased a fast pass). Thank goodness I read this post, I am anticipating much confusion and frustration from myself. I'll make sure to try to follow directions carefully, hahahaha. Adding value by phone or online takes 3 days!!! Ridiculous. Suzy: You can still use the old ones at Powell main gates. They should disappear soon with the activation of the new machinery this week. Embacadero MUNI entrance has the new Clipper gates. I had a chance to use one for entry today. They do not have a display on them to indicate remaining balance and transfer expiration time. Is this their way of trying to convince users to use automatic payment? The gates are incredibly slow to open after tagging. The lines will be huge during rush hour waiting for these. I managed to figure out my transfer expires in 90 min when I debarked the N. Muni turnstiles used to give 120 minute transfers. Why have so many deterrents? The gates are definitely slow, but if the gate is open, you don't have to wait for the gate to close to swipe your pass or tag your Clipper card (unlike BART). When exiting, if you tailgate someone, you don't have to wait for the gate to close, then reopen it exit, just continue walking. The official rule for transfers is 90 minutes. You got 120 minutes? You got lucky. Every turnstile I've used in the past has given 120 minute transfers.